On August 31, Consul General Hong Lei met with Indiana State Senate Majority Caucus Chair James Merritt in Indianapolis, the State Capital. Consul General Hong Lei introduced China's cooperation and exchanges with Indiana as well as China's economic and social development. He said that the significant progress of China-Indiana exchanges and cooperation in economy, trade, culture and education is a concrete manifestation of the deepening development of China-US relations. In a few days, President Xi Jinping will meet with President Barack Obama during the G20 Hangzhou Summit, which will give guidance for future development of China-US relations. Sub-national cooperation between the two countries have broad prospects. The Chinese side hopes Chairman Merritt could continue his support for Indiana's cooperation with China and China-US relations . Speaking highly of China's economic and social development and progress of US-China relations, Chairman Merritt said that Indiana needs to cooperate with China for its economic development. 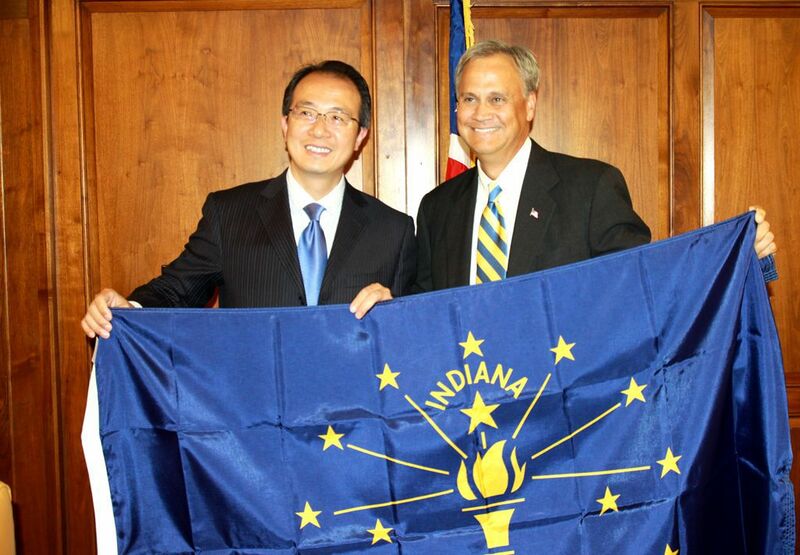 Indiana welcomes more Chinese investment and more Chinese students. Deputy Consul General Yu Peng, Indiana State Senate President Pro Tempore's Chief of Staff Jeff Papa and House Speaker's Chief of Staff Lesley Crane were present at the meeting.